When the pH of your aquarium is too high, or alkaline, the health of your whole aquarium can suffer. Furthermore, according to the "Tropical Fish Magazine" website, using chemicals to reduce pH can make the problem worse: When they wear off, your water is right back to its original alkalinity. A natural approach is safer for your fish and more sustainable in the long run. A high pH is associated with high levels of ammonia, according to a Colorado State University website. Therefore, start to fix your pH naturally by reducing the ammonia in your aquarium -- namely by removing fish waste regularly and leftover food as it occurs. Use a simple suction device to clean debris out of your gravel. Remove decorations and scrub them gently to remove debris, but don’t use soap, which contains harmful chemicals. Perform a partial water change of no more than 25 percent of the total water each week, and remember to change the water weekly to avoid ammonia buildup in the future. Sometimes pH can rise when your filtration system fails or is inadequate for the size of your aquarium. If your filter is functioning but pH is too high, try upgrading to a larger filter or adding an additional one. According to an Oklahoma State University website, while you can and should scrub your mechanical filters to remove debris, don’t clean the “gunk” off your bio-filter -- instead, rinse it gently with water once a month to remove clogs. The bacteria that builds up on your bio-filter is essential for maintaining balance in your aquarium. Peat is a natural pH reducer; it’s easy to find and to use. A Portland State University website recommends pouring 1 quart of peat per 25 gallons of aquarium water into a mesh bag. Place the bag in your aquarium in a spot where water can run through it; replace it every 30 days or as needed. You may also insert the peat bag directly into your bio filter. 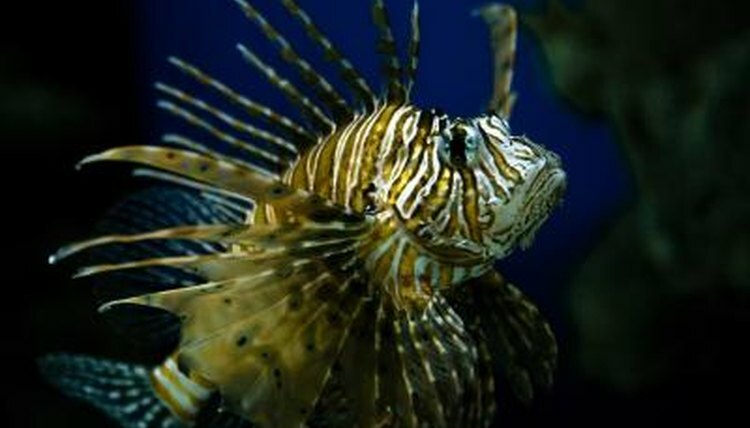 According to Duke University, the tannins in driftwood can also lower the pH of your aquarium. An abundance of tank mates can raise the pH of an aquarium due to an increase in waste and leftover food. Instead of having to constantly treat the symptom by vacuuming your tank, consider removing some of your fish and placing them in a different aquarium. You may also consider obtaining an aquarium that is longer than it is tall. The Virginia Institute of Marine Science states that aquariums with a larger surface area will help with biological buildup at the bottom and aeration on top.